The Island of Mull and the neighbouring Island of Iona lie just off the west coast of Scotland. 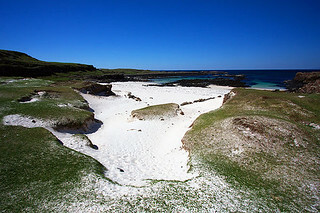 Mull is the second largest of the Inner Hebridean Islands with an area of approximately 340 square miles. It is the fourth largest Scottish island. 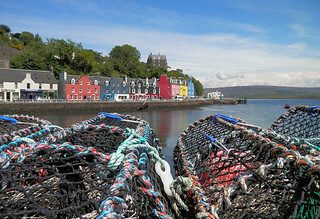 The main town on the island is Tobermory, famous for its colourful, painted buildings. This is perhaps just as well known as Balamory from the BBC’s television programme. Tobermory was built as a fishing port in the late 18th century and is now the main town on Mull. It is a picture-postcard of a place with the brightly painted buildings along the main street to the pier and surrounding the bay. The town provides an excellent range of dining, cultural and shopping opportunities, a medical centre, churches, schools, and good sports facilities including a scenic nine-hole golf course. The harbour is always busy with fishing boats, yachts and the ferry to and from Kilchoan. Outside the buzz of Tobermory, the Isle of Mull boasts extraordinary and diverse scenery. From the dramatic Gribun cliffs and the shark-fin peak of Ben More to the white sands of Calgary Bay, Mull has undoubted appeal for all. A multitude of sea lochs give Mull over 500km of coastline to be explored by kayaks, yachts and divers or on land by foot or mountain bike. The awe-inspiring landscape is also a strong attraction for artists of every discipline.